People stop on a highway near a mobile phone antenna tower to check for mobile phone signal, after the area was hit by Hurricane Maria, in Dorado, Puerto Rico September 22, 2017. SAN JUAN, Puerto Rico - Emergency officials in Puerto Rico raced on Saturday to evacuate tens of thousands of people from a river valley below a dam in the island’s northwest, which is on the verge of collapse under the weight of flooding in the aftermath of Hurricane Maria. The potential calamity was unfolding as Puerto Ricans struggled without electricity to clean up and dig out from the devastation left days earlier by Maria, which has killed at least 25 people across the Caribbean, according to officials and media reports. Some 70,000 people live in a cluster of communities under evacuation downstream from the earthen dam on the rain-swollen Guajataca River, Puerto Rico Governor Ricardo Rossello said in a late-afternoon news conference on Friday. Residents of the area were being ferried to higher ground in buses, according to bulletins issued by the National Weather Service from its office in San Juan, the capital of the U.S. island territory. Christina Villalba, an official for the island’s emergency management agency, said there was little doubt the dam was about to break. “It could be tonight, it could be tomorrow, it could be in the next few days, but it’s very likely it will be soon,” she told Reuters by telephone on Friday night. She said authorities aimed to complete evacuations within hours. Governor Ricardo Rossello went to the municipality of Isabela on Friday night and told mayor Carlos Delgado that an evacuation there was urgent, his office said in a statement. Rossello said the rains sparked by Maria had cracked the dam and could cause fatal flooding. Puerto Rico’s national guard had been mobilized to help the police evacuate all necessary areas, Rossello said. 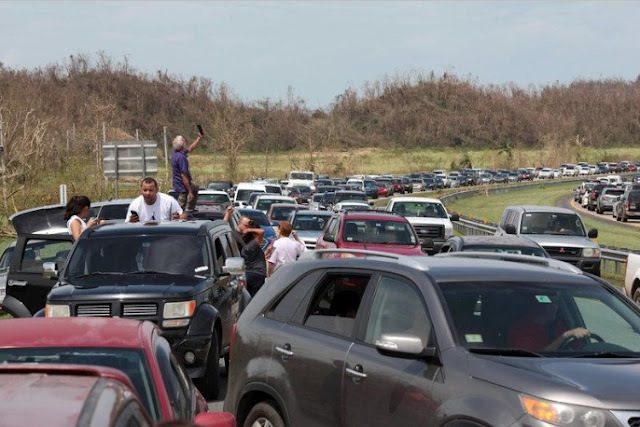 People had begun leaving nearby areas, but one small community was refusing and Rossello instructed the police to step in under a law that mandated them to remove the local population in an emergency, the statement said. Villalba could not say how many people had already been evacuated, or how authorities were communicating with residents to organize the evacuation. Maria, the second major hurricane to savage the Caribbean this month and the most powerful storm to strike Puerto Rico in nearly a century, carved a path of destruction on Wednesday. The island remained entirely without electricity, except for emergency generators, two days later. Telephone service was also unreliable. Roofs were ripped from many homes and the landscape was littered with tangles of rubble, uprooted trees and fallen power lines. Torrential downpours from the storm sent several rivers to record flood levels. Officials confirmed on Friday at least six storm-related fatalities in Puerto Rico, an island of 3.4 million inhabitants - three from landslides in Utuado, in the island’s mountainous center, two drownings in Toa Baja, west of San Juan, and a person near San Juan who was struck by a piece of wind-blown lumber. Earlier news reports had put the island’s death toll as high as 15. “We know of other potential fatalities through unofficial channels that we haven’t been able to confirm,” said Hector Pesquera, the government’s secretary of public safety. The storm was expected to tally $45 billion in damage and lost economic activity across the Caribbean, with at least $30 billion of that in Puerto Rico, said Chuck Watson, a disaster modeler at Enki Research in Savannah, Georgia. Elsewhere in the Caribbean, 14 deaths were reported on Dominica, an island nation of 71,000 inhabitants. Two people were killed in the French territory of Guadeloupe and one in the U.S. Virgin Islands. Two people died when the storm roared past the Dominican Republic on Thursday, according to media outlet El Jaya. Maria churned past the Turks and Caicos Islands on Friday, then skirted away from the Bahamas, sparing both from the brunt of the storm, according to the U.S. National Hurricane Center. It still had sustained winds of up to 120 miles per hour (195 km/h) on Saturday, making it a Category 3 hurricane, but was expected to weaken gradually over the next two days as it turned more sharply to the north. Storm swells driven by Maria were expected to reach the southeastern coast of the U.S mainland on Friday, the NHC said, although it was too soon to determine what, if any, other direct effects it would have. Maria passed close by the U.S. Virgin Island of St. Croix, home to about 55,000 people, early on Wednesday, knocking out electricity and most mobile phone service. It hit about two weeks after Hurricane Irma pounded two other U.S. Virgin Islands, St. Thomas and St. John. The islands’ governor, Kenneth Mapp, said it was possible that St. Thomas and St. Croix might reopen to some cruise liner traffic in a month. Irma, one of the most powerful Atlantic storms on record, killed more than 80 people in the Caribbean and the United States. It followed Harvey, which also killed more than 80 people when it struck Texas in late August and caused flooding in Houston. Emergency officials in Puerto Rico raced on Saturday to evacuate tens of thousands of people from a river valley below a dam in the island’s northwest, which is on the verge of collapse under the weight of flooding in the aftermath of Hurricane Maria.